Today I would like to share some truly beautiful and spiritual items found recently on etsy. 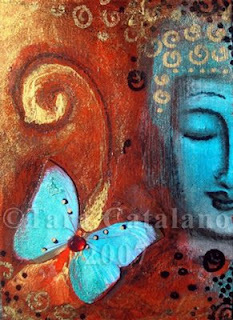 The first is a stunning painting of Buddha, this beauty was created by Tcatalano this is actually a Giclee, (zhee clay) which is a high quality reproduction of an original painting, which is done on canvas. This artist creates truly breathtaking paintings with a spiritual theme, many of them include Buddha, she likes to refer to her paintings as yoga for the eyes! Her work can be found in a number of galleries in Arizona, where she lives. I hope you’ll stop by this shop and breathe in the buddha nature! 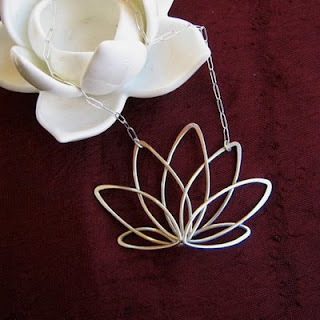 Next, is this beautiful Lotus Necklace by LaLaDesignStudio The following is an excerpt of the necklace description, taken from this designer’s store listing. The Lotus is a very important symbol in India and of Buddhism. It refers to the complete purification of body, speech and mind, and the blossoming of wholesome deeds in liberation. The lotus refers to many aspects of the path, as it grows from the mud (samsara), up through muddy water it appears clean on the surface (purification), and finally produces a beautiful flower (enlightenment). Pundarika, the White Lotus, represents the state of spiritual perfection and total mental purity. LaLaDesignStudio’s store has a variety of very lovely spiritually minded pieces, I hope you’ll stop by and be sure to read the beautiful descriptions that go along with each piece! These are gorgeous Cyd- I am feeling more centered already- thank you for posting this! Hi Kebi, Cat & Claire!! So great to see you all and thanks so much for stopping by! !